Historical fiction is a messy business: too much history and it’s dry; too much fiction and readers assume you don’t know your history. Few authors juggle fact and fiction more deftly than Hillary Mantel in Wolf Hall, but she made a mistake in her choice of copy editor. Whether or not a reader can overlook this flaw is determined by how interested they are in the story. Much has been written about Henry VIII and his many wives, but Mantel takes one of Henry’s advisers (Thomas Cromwell) as the book’s center and keeps Henry largely offstage. By doing so, she spares herself the difficulty of writing him and the book feels more authentic for it. If there is information that Cromwell is not privy to, the reader isn’t either. Any prior historical knowledge goes a long way. 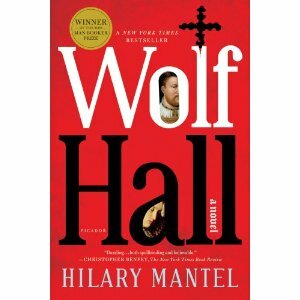 Wolf Hall begins by establishing Cromwell’s humble origins, but quickly moves to his close relationship with Cardinal Wolsey (one of the king’s advisers) just as he is falling out of favor. When Cromwell rises to his own place at the King’s side, he advocates for the English Reformation. This break from the Catholic church allows Henry to divorce his first wife, Catherine of Aragon, and marry Anne Boleyn. As Cromwell speaks for the Reformation, his most notable opponent is Thomas More, who argues for the continued supremacy of the Pope. Because Cromwell is the hero of this book, More becomes the villain by default. He is rigid in his adherence to papal authority and cast as more fanatical than sound. That Mantel found a new angle for Henry VIII’s frequently told story is her greatest achievement and I’m curious how she will handle Anne Boleyn’s downfall in the sequel. Cavendish’s ‘yes, yes […]’ earns quotation marks… but not Cromwell’s conversation with the Cardinal. Why not? Plus, it’s all mashed into one messy paragraph. Other passages which lack quotation marks lack them because the dialogue is being casually summarized or left unspoken. Here though, there’s no reason to assume that the Cardinal does not actually mention Putney and Gascoigne. When she reverts to this stream-of-consciousness style, it feels lazy, as though the writing is breaking down over the course of the conversation. Like when you have a friend who is summarizing her hilarious time out with three other friends, none of whom you know, and is so familiar with their personalities that she doesn’t bother to clarify which “he” she’s talking about or differentiate their voices. It would bother me less if Mantel picked a style and stuck with it; either can work, but they don’t work well together. I did not expect to enjoy this book so much. Each book in the trilogy ends with an execution: Thomas More, Anne Boleyn, and finally Thomas Cromwell himself. How much suspense and intensity can a reader expect when they know what’s going to happen? By taking a new angle on this story, Mantel generates a lot of intensity. Bring Up the Bodies is next on my queue; it picks up right where Wolf Hall ends and I would rather read it while the history is fresh in my mind. If Mantel’s recounting of Anne Boleyn’s downfall is as vibrant as Wolf Hall, it will feel like a new story. Overall: 4.3 The middle is a little mushy in places, but the beginning and end are strong. Translation: Read it. If you don’t remember your history, there’s always Wikipedia.